You are here: Home 2014 December How to Convert a Cisco 3502i AP to Operate in an Autonomous Mode? How to Convert a Cisco 3502i AP to Operate in an Autonomous Mode? Is it possible to convert Air Cap 3502i access point to the standalone mode? 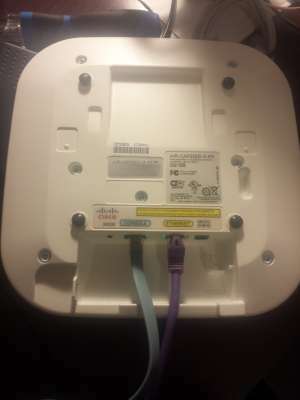 How to convert a CAPWAP-based Cisco 3502i Access Point to operate in an autonomous mode? Generally, Cisco’s firmware on the device is designed to only work in managed mode, which requires a CAPWAP compatible appliance or server on the network. Before you can start working on the device, you need to ensure that there is a TFTP server on the network. Upload the firmware ap3g1-k9w7-tar.152-2.JB.tar to the device and make sure that you can access the file. This is how the device install firmware upgrades. If you don’t have the file, scour Cisco’s website for the image. It’s licensed software. The first thing to do is connect to the console port of the WAP and connect via telnet into the device. This provides a direct interface to manage via RS232 serial. 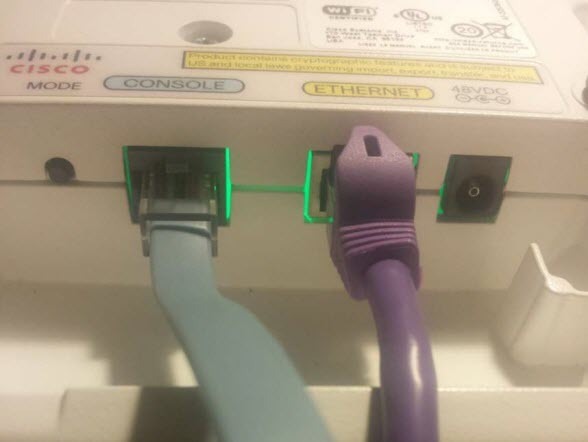 The blue cable above is a Cisco Console Cable RJ45-to-DB9, which is a roll-over Cat5e cable that terminates in a DB9 end. Since my laptop, nor many others, have a serial port anymore, I used a Plugable USB to RS-232 DB9 Serial Adapter (Prolific PL2303HX Rev D Chipset). This device is detected as a standard serial connection in Linux, so no messing around with drivers is needed. Once connected up, start up minicom as root and configure it with the necessary baud rates and etc to listen over /dev/ttyUSB0. If done so correctly, powering on the WAP should present the device’s boot screen and autoconfig, (which won’t connect), in your telnet terminal. If all is working well, remove power from the device and hold in the “Mode” button and reconnect power. You need to keep the button depressed for at least 30 seconds after the device boots in order for the bootrom to start. Alternatively, I believe pressing ESC as the device starts loading its kernel may work as well. Once you have a terminal, (indicated by “AP:” on the screen), you can issue commands to the ROMMON. and WAIT! This flashing process will probably take a while, about 10-15 minutes or so. After the entire operation completes, issue the next set of commands to initialize the new firmware. This device is an enterprise-grade component; as such it supports Power Over Ethernet. Since this firmware is not centrally managed, it provides a web GUI for management. Load up the device’s IP in a web browser and use admin / Cisco to get started. Why You Should Upgrade with Cisco 802.11ac Solution?